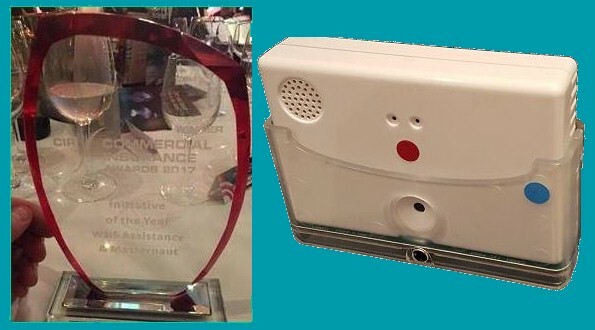 Charlie Davies, CCww's Lab-Technician, has won a Technology Star Award, being part of the team that developed a tracker product that won (Mar-17) a Commercial Insurance Award (see below). The award was sponsored by Datacenta Hosting, and was given to "the young person who has delivered measurable success thought the application or use of information and communication technology". Above, we can see Charlie (middle) being congratulated by Angela Piromalli (CEO of Rise, the organiser) and Gordon Fong (CEO of Datacenta Hosting). Charlie commented, "Winning was totally unexpected, and I feel honoured. It was great to be part of the awards process, which provides much-needed recognition of the achievements of so many local young people." Above, we see Charlie celebrating with Richard Carter, CCww's Managing Director. We will be demonstrating our R13/14 UE NB-IoT Protocol-Stack software (L1C, AS, NAS) on licensee and partner platforms, with integrated RF; we licence, integrate, customise, optimise, support... from protocol-stack to full solution. We aim to provide the lowest footprint and latency for the best data and battery performance. Find out how we can bring your IoT plans to fruition - NB and Cat M1. We will be demonstrating our R13/14 UE NB-IoT Protocol-Stack software (L1C, AS, NAS) on a dual-core (Risc-5) SoC platform. We offer flexible licensing terms and comprehensive integration and test services. We'd also like to discuss your LTE Cat-M1 plans, as we embark on an upgrade to our NB protocol-stack to full Cat-M1 specification, in conjunction with licensee hardware paltforms. We plan to have the lowest footprint and latency for the best data and battery performance. Find out how we can bring your IoT plans to fruition. Bournemouth, UK, 22nd February 2018 – Communications Consultants Worldwide Ltd. (CCww), global innovator of 3GPP® technologies, has licensed its NB-IoT Protocol-Stack software to WuQi Technologies Inc., a leading global developer of highly integrated mixed-signal SoC solutions, and the latest licensee of CCww’s NB-IoT Release 13 UE protocol-stack software. Communications Consultants Worldwide (CCww) is working with WuQi Technologies for the integration of its NB-IoT Protocol-Stack software onto WuQi Technologies’ highly innovative SoC. This relationship, catalyzed by T2M, is enabling the production of a highly integrated, very low power, NB-IoT SoC chipset targeting IoT Smart City, Smart Home, and wearable applications. Bournemouth, UK, 25th Sep 2017 – Communications Consultants Worldwide Ltd. (CCww), global innovator of 3GPP technologies has licensed its NB-IoT protocol-stack software to a leading Shanghai and Silicon Valley based developer of highly integrated and unique mixed-signal SoC solutions. This relationship, catalyzed by T2M, will enable the production of the highly integrated NB-IoT SoC chipset targeting IoT, Logistics, Smart metering, Health and Fitness markets. NB-IoT (Narrow-Band Internet-of-Things) is the future global solution to low-cost and low-power for cellular machine-to-machine connectivity, for use in metering, telematics, security… where very low maintenance and up to 10-years battery-life are required. CCww’s NB-IoT R13 Protocol-stack SW is enabling chip manufacturers and module manufacturers to rapidly enter the market with small-footprint, broadly-tested, and stable SW. R14 is under development, and will be available in 2Q18. Nigel Dixon, CEO of T2M, remarked “Our global relationships in the semiconductor market coupled with our extensive expertise in wireless semiconductor technology enabled us to join the latest licensee with a leading NB-IOT protocol-stack SW and support provider, to take them through integration, certification and mass deployment. We are excited to be enabling companies to build leadership products with our clients’ state-of-the-art technologies”. Masternaut's M-Call vehicle management solution, M-Call, has won an award for innovation at the Commerical Insurance Awards dinner. CCww created M-Call based on the TracSure(tm) 700 reference design, to Masternaut's specification. It uses SiRF GPS with CCww's STAR-Let GSM-GPRS modem-module, reporting position, acceleration, heading, time along with configuration/manament data in real-time with journey start/end points recorded. Accidents are automatically identified and detailed information is sent immediately for FNOL processing along with a voice-call set-up. M-Call is typically installed in a vehicle and working in under a minute. The Rt Hon. 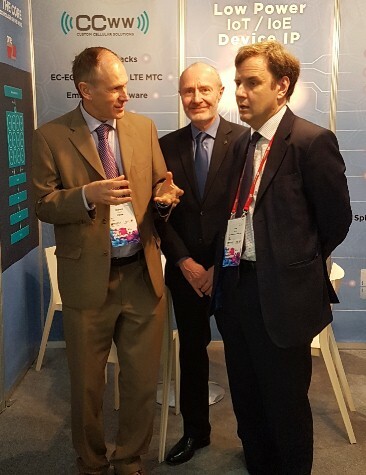 Greg Hands (right) MP visited CCww's stand at MWC to learn more about CCww's global technology exports to countries including: China, India, Israel, India, Mexico, South Africa, Taiwan and USA. Speaking with the Minister are Richard Carter (left), CCww Managing Director, and Anthony Cutler (centre), VP Sales & Marketing. Fleet managers nationwide strive to optimise the lifecycle, service maintenance and utilisation of their vehicles. By adopting the right strategic platform, there is an opportunity to leverage multiple sources of telematics and other vehicle data to optimise the lifecycle of vehicles. This event, hosted by Microsoft at their Headquarters in Reading, UK, will demonstrate the art of the possible using telematics-enabled fleet management, with examples of automotive and assets trackers based on TracSure(tm) technology developed by CCww. Use our 'contacts' form for more information. Why not sign-up using: https://enterprise.microsoft.com/en-gb/event/evolution-fleet-management/ and see how TracSure(tm), in conjunction with Mint Tulip, can transform your fleet management. CCww has joined the GSMA's Mobile IoT Innovators community (part of the Mobile IoT Initiative) to share information and ideas on NB-IoT and EC-GSM-IoT technologies. CCww's CEO, Richard Carter, attended the inaugural networking-event of the Mobile IoT Innovators' community in Barcelona on 14th November and shared innovative ideas with the industry's key players including operators, chip and module suppliers, as well as smart-meter manufacturers. CCww is developing a portable NB-IoT UE embedded protocol stack for licensing to chip vendors and module designers. Use our 'contacts' form to find out more! 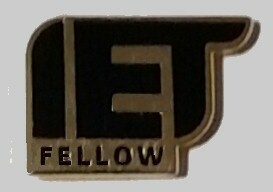 CCww is pleased to announce that its VP of Sales and Marketing, Anthony Cutler, has been elected to Fellow of the Institution of Engineering and Technology (FIET), one of the world’s leading engineering institutions with over 163,000 members in 127 countries. Richard Carter attended the 6th China-UK Internet Forum on 19th October 2015 at the BIS Conference Centre in London. The forum was jointly organised by China's State Internet Information Office and the UK Department for Culture, Media and Sport. Delegates from the Cyberspace Administration of China and the business delegation of President Xi Jinping's state-visit attended the event, along with representatives from various UK technology businesses. There were interesting presentations on the progress of 5G research and an update on the IoT, as well as a talk by the Minister of State for Culture and the Digital Economy, Ed Vaizey regarding co-operation between UK and Chinese businesses. CCww is updating its GPRS Layer-3 for IoT operation; the development is host-based for easy integration and test, and available as a complete software subsystem, including test-scripts and documentation. CCww has become a full member of ETSI, the global standards organisation for Information and Communication Technologies, based in Sophia Antipolis (south of France). In the photo (below), Richard Carter, MD CCww receives the membership certificate from Simon Hicks, the ETSI General Assembly Chairman. CCww are contributors to the OneM2M Project, the global standards initiative for M2M / IoT.